Yes, I promised to do this earlier. Yes, I'm guilty! However things happened in the meanwhile and I just couldn't bring myself to do this . . . until now. In the meanwhile I clocked in a good amount of time with these monsters and learned a few trick or two, which I'll mention next. The biggest lesson I learned is that the Grasshopper excels at side-peeking builds with the exception of the 5P (it can do both side-peeking and hillhumping). This means that not only you should try to mount your weaponry according to this, but also you should set your weaponry to allow it. At first it'll feel weird, since you'll be mixing torso and arm hardpoints (without arm lock things can get messy) but once you get used to it it'll let you trade well. At first I went full-on brawler mode (weapons are grouped as arm+torso+arm), but this forces you to expose the whole thing and the GHR doesn't like taking damage in the face. It's still possible to do it if you have a big engine in the thing and just don't stop moving, but if you like LPLs and such I'd suggest going for a side-peeking configuration. Right side MLs/MPLs, left side LLs/LPLs. You get the idea. 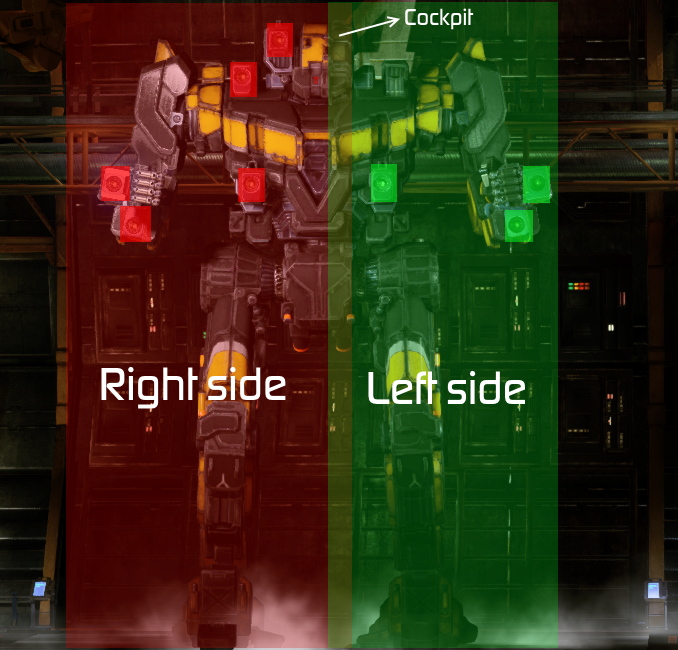 Basically you find a nice corner, move forward while twisting your torso 90° towards your enemies briefly, dump a good amount of damage and expose only a fraction of your 'Mech for a few seconds, twist to 0° position while backing off into the cover again. By doing this you present a smaller target for your enemies and it'll be harder them to aim for your weak points. Since the GHR tends to take more damage in the CT, this also allows you to mitigate some damage in the STs which otherwise don't tend to tank under heavy fire. Are you thinking of bringing an ERLL and having a nice range boost? Builds with ghost heat that force you to stagger groups? Hands off! The GHR doesn't like long face-time builds. In fact, it doesn't like to face opponents at all. Your CT is a ticking time bomb. That's why you should rely on quick burning lasers, quick peeks and lots of movement/twisting in the meanwhile. I'd say LL would be the longest burning laser I'd put on this 'Mech, but generally you want to stick with MPL/ML/LPL. If you manage to keep your face-time low, the amount this thing can tank is really amazing. Even with an XL engine. The smallest engine I'd put in a GHR is 325, unless you really want to do STD in which case that'd be 300. Though being a 70 ton heavy the GHR does not have the best mobility. Many of my friends complain that the GHR feels sluggish and that is indeed true. Some variants get some acceleration and torso twist bonuses but they only help so much. That's why you really need a big engine in this thing, ideally an XL340. This'll boost your speed to 86.4 KPH and make your torso twist somewhat responsive. Using an XL also allows you to cram more DHS in and another trick I'll mention below. Now we have some general pointers on how to build for this thing. Next, I'll mention my favorite builds for each of these 'Mechs. Note that the amount of builds are limited, not because I can't go into Smurfy and spit out "expert" builds that I haven't touched, but because I'm only going to mention builds that I developed hours after hours of iterative gameplay. These builds are what I do extremely well in, and hopefully you can use them as a template for your own style. The 5J is the only GHR with an increased engine cap (365 max), so it makes sense to make our builds around this increased limit. At first, I found this 'Mech very underpowered. Low hardpoints and worst of all, the least number of hardpoints among GHRs made this thing very unattractive. It also gets an ERLL quirk for some reason and there are only a handful builds you can incorporate ERLLs. So I quickly mastered this and moved on to other GHRs. The story didn't end there though. When I came back with the experience gained from GHRs, I quickly found a niche for this thing. While other GHRs tend to play a bit more in a traditional heavy manner (find a good cover, peek until enemies are gone, relocate, repeat), the 5J lends itself to faster and aggressive gameplay styles. It plays more like a fast Griffin or a Trebuchet. When I realized this and adjusted my builds accordingly, this quickly became one of my favorites. The first build is very modest, but it's my favorite one. Seperate your weapon groups according to their location (RMB-LPLs, LMB-MLs. third group-CT MLs). This is another side-peeker, but you will mostly be on the move so that won't matter much. Despite lacking DPS and sporting a decent alpha, this build excels in mobility and heat efficiency. You will rarely overheat and even then, you'll cool fast enough to use your LPLs. It'll feel extremely responsive with the XL360 and with 3xJJs you will be flying all over the place, getting to places a 70 ton heavy should not be getting to and be very annoying overall. Stick with your mediums and lights and you'll have a great time in this. Possible modifications: You can drop the engine to a 350, remove a DHS and add dual AMS. "Why the hell would I do that?!" you might ask. AMS is indeed a waste of tonnage, but I really like having them if I can. It makes LRM boats sad sometimes and since you tend to be run around in the open with this thing, you tend to get lurmed more often than not. Another modification would be to remove 2xJJs and switch any of the 2xMLs to MPLs. The second build has more punch at range, but it sacrifices some firepower. This plays more conservatively. The added jump jet lets you get to unusual positions. Afterwards you pretty much use your ridiculous heat efficiency, and keep peeking and dumping your alphas. If the game lasts more than 3 minutes you should be getting good scores with this. Don't try to lead the group with this 'Mech as you lack the punch to do so. It's used best in the second line, and shooting enemies who are busy shooting your teammates. Possible modifications: Swap LLs for ERLLs. Congratulations now you can snipe across the maps, but you have also increased your face time by 0.25 seconds and reduced your damage per tick. It'll also get noticeably hot under sustained fire. I tried this modification for 2-3 matches in the group queue and I didn't like it, but I can see its applications in the CW with that extra 10% ERLL cooldown quirk. This is pretty much it for the 5J. You can go crazy and do 3xLPL or 4xLPL, but it demands too many sacrifices from mobility that it makes more sense to just pick another GHR at that point. GHR-5N is definitely my favorite out of the bunch. It has the best KDR among other GHRs with the same number of matches played with 4.52. For the record, that number almost doubles my 5J KDR (2.5). This is mostly because I immediately started doing well with this thing. Why? First, firepower. It has the most amount of energy hardpoints between GHR variants. 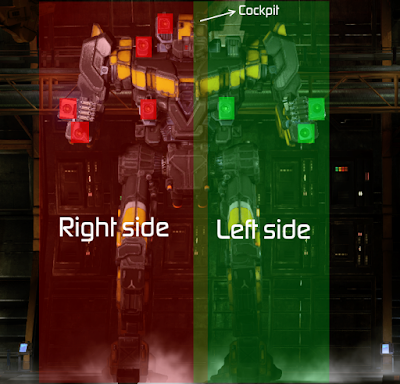 You get 8 energy hardpoints which are conveniently divided as 4-4 between arms and the torso. Perfect. Second, it gets -10% energy heat reduction and -12.5% energy cooldown, which increase your DPS even further. Lastly, it gets a nice 7.5% torso twist rate bonus for extra survivability and better target tracking. All of these make the 5N the ultimate GHR variant and one of the most formidable laser boats out there. I'd put this thing right beside the BNC-3M and TDR-5SS in terms of scaryness. Its only problem is that it doesn't get any extra energy range quirks, which makes range and damage application a constant concern. There's a lot of min-maxing going on here! Max engine, max heatsinks, almost full JJs . . . You may have noticed that this build doesn't have the Endo-Steel upgrade. The reason for this is that 8xMPL only cost you 16 tons, which leaves a lot of free tonnage but little critical slots to put stuff in. Putting standard structure in allows you to make room for two more heatsinks and three jump jets. Then, this thing only has 45 leg armor. Normally I'd never take out a brawly heavy with that little leg armor, but the GHR gets +15 leg armor quirk so It only made sense to subtract that amount to make room for something more critical like a DHS or a JJ. In case you didn't know, 8xMPL doesn't have any ghost heat penalty (why the MLs have it, we'll never know) so you can alpha over and over again. With 21xDHS you can alpha them 3.5 times which amounts to 168 damage and you'll do this in about 7 seconds. What this means is basically under 242 meters there are only a few handful 'Mechs that can outtrade you. If you can survive their first alpha, you will rip them to shreds before they can alpha for a second time. Right side group (RMB): Basically everything in RA, RT and HD (5xMPLs total). Left side group (LMB): The rest in LT and LA (3xMPLs total). Arms group (third button): LA+RA (4xMPLs total). As you can see, this 'Mech lends itself to right side peeking, which favors the "counter-clockwise nascar meta" on most maps. Left side group is great for those heat-management moments and the arms group is useful for shooting lights and bringing down UAVs. Due to the arm/torso separation, I suggest you to enable arm lock unless you really need those arms unlocked. Otherwise since the torso twists pretty quickly (due to the quirk), you tend to spread your damage instead of focusing it. Arm lock on this 'Mech doesn't feel as awkward as the others. I'm sorry, but this is all I have for the 5N. I tried a few other builds, but nothing felt as good and as satisfying as this one, so I kept on improving this build instead. If you want more ranged stuff, the other GHRs do a better job at it. I was expecting this to be my mainstay GHR, but those two high mounted energy hardpoints didn't turn out to be a game changer as I hoped. Yes, you can have limited hillhumping capability with those, but two LLs or LPLs don't hit hard enough and will give you bad trades against proper laser vomits. Putting PPCs there is even more laughable without proper quirks. While 53 laser alpha is pretty normal for a clan laser vomit, when you achieve these numbers on the IS side, things tend to start getting ridiculous due to the shorter burn time. Especially when you're sporting triple LPLs which hit harder(read: highest damage per duration) than any laser in this game. In order to accommodate triple LPLs some sacrifices has to be made and therefore this build has a smaller engine, less DHS and only a single jump jets. It plays differently too. While the previous builds were mostly heat efficient "endurance fighters", this build plays more cautiously due to the massive heat spikes from each alpha. What you do is, find a nice corner that allows right side peeking, dump your alpha, do it again and then wait for your heat to dissipate. You can alpha two times before being forced to heat manage. I suggest having a 2xLPL(torso lasers) "heat management" group for those times. This build tends to get many kills with moderate damage (700-800 damage with 5-6 kills are common) but it's not because you're killstealing or anything, it's because the alphas are so quick and devastating that enemies tend to die very quickly. All you need is a precise and calm aim. One thing that's annoying with this build and 'Mech is that the torso twist is noticeably slower due to the smaller engine and non-quirked torso. This is not a problem when you're engaging slow targets, but it quickly becomes a massive problem when you're up against very fast moving lights and mediums. Arctic Cheetahs are especially very annoying to deal. I suggest you to simply avoid them and focus on bigger targets. Now this is the traditional hillhumper variant. If you were hoping for a smaller BNC-3M though, better let go of your hopes since this 'Mech has minimal weapon quirks and without the holy grail of "energy heat reduction" quirk, it usually runs very hot. So while it has the same amount of hardpoints as the 5N, utilizing them properly is almost impossible save for some underpowered builds such as non-Endo 8xML build. The good news is, this variant comes with lots of extra armor. So while you don't have the gank, you have the better tank. Which makes up for the former simply because you persist longer on the battlefield. This is especially a good recipe for CW where armor and durability is highly valued. This plays very similar to a laser vomit Battlemaster. Find a cozy ramp, move up, dump LPLs and back off into cover while twisting and mashing that JJ button. 3xLPLs have a limited alpha, but only having three lets you alpha repeatedly and the damage quickly adds up. Perhaps not ideal for the group queue where big alphas are favored over heat efficiency, but definitely attractive for CW. I also group the right side LPLs seperately so I can side-peek when necessary as well. I think in overall, this build goes well with the "tanky hillhumping GHR" theme of this variant. Here's two 5P builds that I've been doodling on Smurfy. I only briefly tested them in testing grounds and they are hot as hell, but they could be amusing in a group environment where you individual performance doesn't matter much. Without energy heat generation quirks using all of the hardpoints on this 'Mech is a pipe dream. The first one is a mid-range component cutter. You can alpha two times but afterwards it just won't cool down. Probably usable and effective with strict trigger discipline. ML+LL combos are very meh though. 63 ghost heat free alpha. You can't alpha twice and it just won't cool down. The BNC-3M on the other hand runs this build like a boss. Probably unusable. The one-shot potential is high though. After 22 hours of gameplay, I have to say that the GHR is an effective and fun 'Mech. Despite its current unpopularity, I really hope people (and top of the food chain) give this 'Mech a second try. It takes some time to adjust to its quirky hitboxes and hardpoint locations but it's so worth it in the end. It's an undiscovered gem just like the BLR-1G/3S and the BNC-3M. Though they're slowly gaining traction.